Description: This book illustrates and explains how just one, well-timed, fresh juice a day can transform health. Going one step further, it helps unravel and apply the science of creating a habit, assuring that juicing becomes easy and enjoyable for life. Verdict: Now that farmers markets are opening up and the onslaught of fresh fruits and vegetables—like rainbow chard, strawberries, mango, and Meyer lemons—are filling up the stalls, it’s time to break out your juicer. While some traditional fruit juices contain as much sugar as a candy bar (beware! ), the right mix of high-fiber greens, citrus, and herbs can produce a vitamin-rich concoction that doesn’t taste like lawn clippings! So, here we have it. 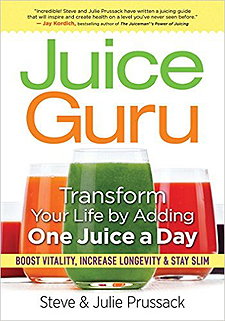 'Juice Guru: Transform Your Life by Adding One Juice a Day is a book on Juice that is all you need to know ... and more! Indeed, this book illustrates (and explains) how a simple little daily juice from these recipes can provide boundless energy, a youthful vibrancy, a slimmer figure, sharper focus, improved health and the desire to make healthier and improved food choices in general. The best thing about juicing is that anyone can do it and the results are almost immediate. Using the simple and easy-to-follow protocols in this book is a huge step towards improving every aspect of life without a personality change or altering how your time is spent. The 100 flavorful, bursting-with-goodness fruit and vegetable juices here are full of nutritious phytonutrients that promote a healthy lifestyle at home, work or play. This comprehensive book demystifies juicing and helps to remove all the barriers that stand in the way of incorporating this regime for a healthy lifestyle. As for who wrote it, well, Steve Prussack is the founder of Juice Guru, a business dedicated to spreading the message about juicing for healthy living. He is also the founder of the accredited Juice Guru Academy, which offers courses in juice therapy and health education, and trains juice coaches around the world. Julie Prussack is an environmental lawyer and administrative law judge who became an avid juicer when she reunited with her high school sweetheart, Steve. Julie became the first certified Juice Guru Practitioner at the age of 40, and has partnered with Steve to grow the Juice Guru brand.